What is the title of your Comps? What is your Comps topic (describe)? For my Music Comps, I wrote excerpts of a larger piece called (III+I) movements for (3+1). It’s a four-movement quartet for one acoustic piano and three Prepared Digital Pianos. Prepared digital pianos are keyboards plugged into laptops that are running a software called bitKlavier, which was written by Dan Trueman, a composer, Princeton professor, and Carleton alum. For Comps, I wrote excerpts from movements 2-4, about 15 minutes of music. The piece and the essays I wrote alongside it explore two relationships: (1) between composer and audience and (2) between composer or performer and technology. Why did you choose your Comps topic? In the Music Composition Studio course, which I took as a sophomore, I began exploring an old version of the bitKlavier software and got the idea of integrating electronics with acoustic music. In the year after I took that course, a new and more accessible version of bitKlavier was released. 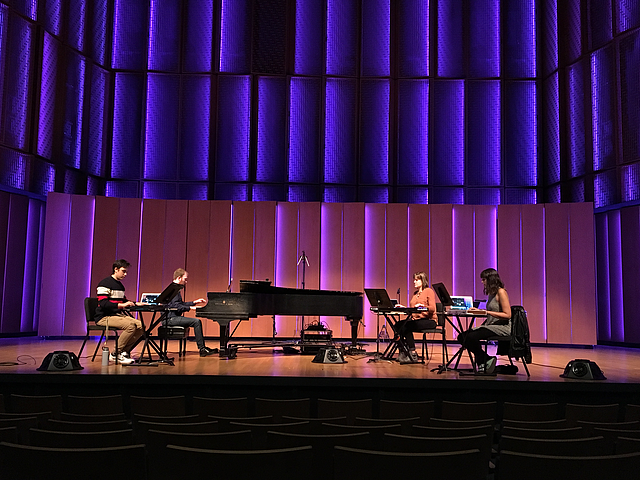 With good timing, Comps became an opportunity to dig more into this technology and the idea of making music with both acoustic and electronic elements, while putting thought into these broader theoretical questions about how a composer interacts with technology and with an audience. What was the most interesting article/or piece of information that you found while researching your Comps? The scholarship I read about human-computer interaction, both inside and outside of music, tended to take a heavily philosophical approach, constructing theoretical frameworks about how technology behaves and how that behavior influences human behavior. But there is a practical and social element to this topic—certain music software programs are seen as more complex than others, and composers who use those programs are often seen as more serious or virtuosic. That social element rarely appears in the discussions of music technology that I read, and yet the dichotomy between “complex” and “simple” programs can lead us to overlook music that is serious and virtuosic but was made in a different way. What was your Comps process like? My Comps process was mostly reflective of my compositional process. How I write music changes based on the tools I’m using for a given project, but this one required me to learn a new version of this technology that I was only barely familiar with. So I spent a lot of time improvising with a controller keyboard and my laptop, finding sounds that I liked and developing my musical ideas. In addition to writing the piece and producing a score and software presets for the performers, I spent time on the musicological component of the project, studying a number of scores by composer Steve Reich and reading articles about electronic and electroacoustic music. Why do you think it was valuable for you to write a Comps? Writing a piece of music for Comps is not so different from writing a piece for the Composition Studio course or for private composition lessons. But because I also had a chance to think about these broader theoretical questions, I was able to approach this piece with a greater level of thoughtfulness and intentionality. It also gave me an opportunity to reflect on how I write music and what kind of experience I want to create for an audience. Will you expand on your Comps in any way? In the spring after I wrote my Comps, I did a six-credit independent study with Andrea Mazzariello, Carleton’s composition professor, to expand on the excerpts of the piece I had written for Comps. That term, I built on the 30 minutes of music I had written in Composition Studio and Comps, writing another 25 minutes to complete an evening-length version of the piece. It doesn’t have a completed score yet, and the newest 25 minutes have not been performed, but hopefully one day the whole piece will be premiered.